Rumour No. 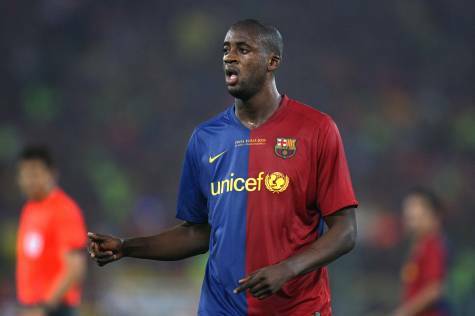 1: Barcelona’s Yaya Toure has put the kibosh on a potential summer move to the Premier League by insisting that ‘his only mission is to stay at Barca and be a success at the club’. Toure has been continually linked with the likes of Chelsea, Arsenal and Manchester City over the past couple of seasons, but the Ivorian seems to have his heart set on remaining at the Camp Nou for the foreseeable future. Rumour No. 2: Bayern Munich midfielder Bastian ‘Pig Rider’ Schweinsteiger has also moved to distance himself from any speculation linking him with a summer switch to the Premier League with Chelsea. The Best of the Rest: Chelsea owner Roman Abramovich will focus on lowering the average age of his squad by specifically bringing in young talent during the off season. Manchester City are sounding out 17-year-old midfielder Salim Harroun Nze’ who currently plays for Boulogne-Billancourt. Everton face a battle with Spanish side Seville for FC Twente’s £8 million-rated striker Bryan Ruiz. Sunderland manager Steve Bruce is keen to turn Alan Hutton‘s loan move from Tottenham into a permanent one. The Black Cats are also keeping close tabs on Bolton’s Matty Taylor. Tottenham are reported to be tracking Palermo midfielder Antonio Nocerino. Birmingham City have issued a ‘hands off’ warning to West Ham regarding defender Liam Ridgewell and midfielder Sebastian Larsson.